The key to prevention is maintenance. This is a principle that can be applied to virtually any machine or mechanical device — from cars to appliances to doors. 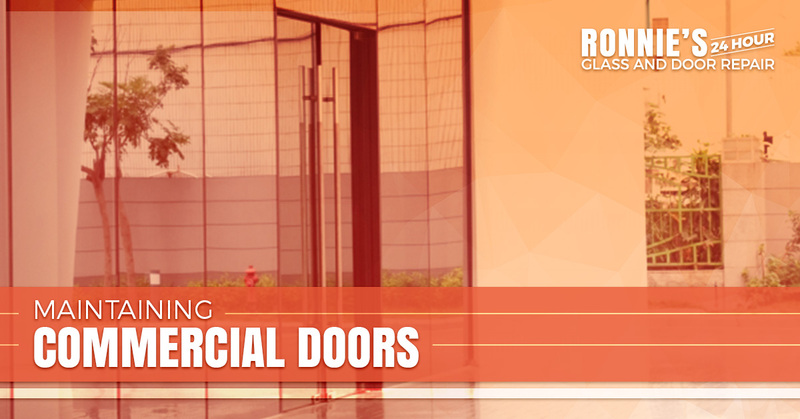 While exterior doors are important in just about any context, they are especially important to commercial properties. A broken or damaged door can disrupt your business and leave your property vulnerable to intruders. Whether you are in need of routine maintenance or a major overhaul, Ronnie’s 24-Hour Glass & Door Repair has the experience and knowledge to help. Learn more about us, our services, and contact us here. How Do I Know When My Door Needs Maintenance? Unfortunately, you can’t just ask your door how it’s doing. Or what’s causing it to underperform. Instead, you have to inspect your commercial doors and recognize signs of damage. While some signs are easy to spot, this is not always the case, and detecting some problems requires an experienced eye. One of the first things to do when inspecting your doors is to try it out and notice if you get any unusual tension or resistance. If your door feels heavy, this is a sign that it may need some maintenance. Similarly, take note of how your door sounds. Is it operating at a louder level than usual? Perhaps it’s creaking or squeaking? If so, this is something that should be addressed sooner rather than later. Remember that it’s much cheaper to fix small problems than it is to let them turn into big, costly issues. Below are some questions to ask yourself when assessing the condition of your commercial doors. Does the door operate smoothly and quietly? Is the movement of the door free of any obstructions? Do all controls and components function properly? Does the door appear level or crooked? Are the hinges loose or damaged? Are all the tracks secure and fastened? Are all the nuts and bolts tight? If you spot any of these problems, contact your local door repair company. As we mentioned, the best type of prevention is regular maintenance. When you have a maintenance plan in place for your commercial doors, you ensure that your doors operate efficiently. For commercial properties and businesses, this is crucial. This not only allows you to continue on with business as usual, but it also helps you avoid the cost associated with commercial door repair and replacement. Just as it’s important to choose the right commercial door manufacturer, it’s also crucial to choose the right commercial door repair and maintenance company. Whether you are in need of an emergency 24-hour door repair or simply want to ensure that your commercial doors are well-maintained and functioning properly, we can handle it. As you probably already gathered from our name, Ronnie’s 24-Hour Glass and Door Repair takes pride in offering residential and commercial door repair 24-hours a day, 7 days a week. If you are in the Fort Worth area and in need of repairs or replacements for your doors or windows, give us a call at 817-369-8845 or fill out this online form.